"I am governor Rick Perry. Nice to meet you, Pepe!" To which one of the people in his entourage whispered in his ear that this was not the name of the principal. It was a team sponsored by Pepe Jeans. The crowds came in droves to see the race. Many journalists compared the turnout to F1's most historic track Silverstone, which packs 150,000 fans on a typical race weekend. 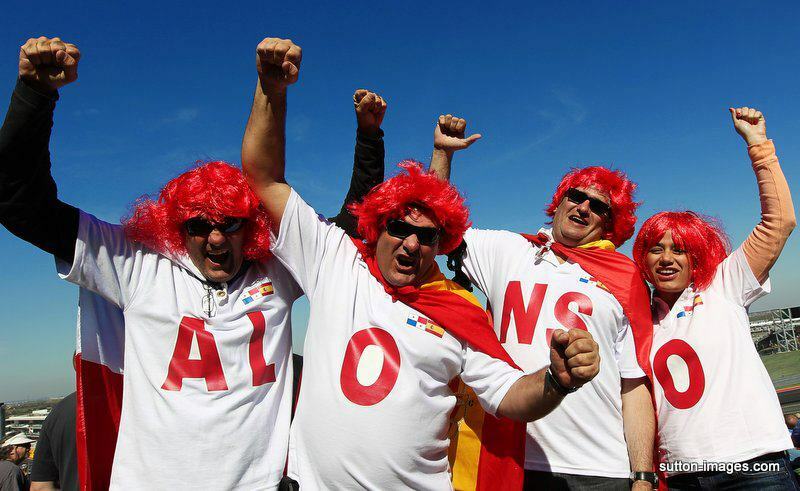 This is truly remarkable for a country in which only 300-400k viewers watch a typical F1 race on TV! And the racetrack? It is totally, absolutely, ridiculously amazing! 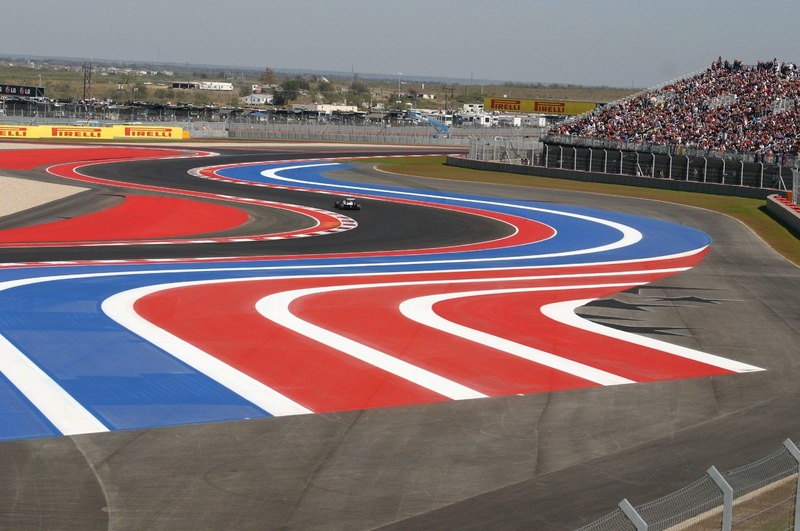 I love the elevation changes, the wide pavement creating opportunities for many different lines through the turns, the uphill blind apex Turn 1, the esses, the 200 mph straightaways, and the wide runoffs encouraging risk taking. The white, red, and blue colors of the U.S. banner along the track look way cool and add a distinctive feel to it! Austin's unique tower design is one of the track's signature attractions! 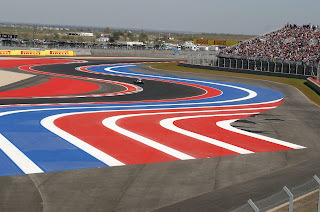 Texas is a perfect location for the U.S. Grand Prix, as it brings a uniquely American flavor to the event. Where else can you see SpeedTV's Will Baxton wear a cowboy hat and boots during the pit interviews? Let's just hope that 7-time World Champion Michael Schumacher's Mustang won't fail to start at the drivers' parade next time around, so he won't have to hitch a ride from Kimi Raikkonen as he did this year. All drivers raved about the new track and how much fun it was to learn it. Studying the track on the simulators paid off immediately for those who had done their homework. Rumors were that Lotus driver Kimi Raikkonen had not studied the track on the simulator and he took a couple of practice sessions to get up to speed. However, he had caught up well enough by qualifying time. Proof positive that simulators pay off with getting up to speed right away, though! The wide pavement allows many different lines through Turn 1! The Austin race was thrilling with many exciting battles all around. You can check the race report and full results here. My intent was to take a more holistic view here and also to share some of the fun stories that you won't necessarily hear on TV or read about on other sites. 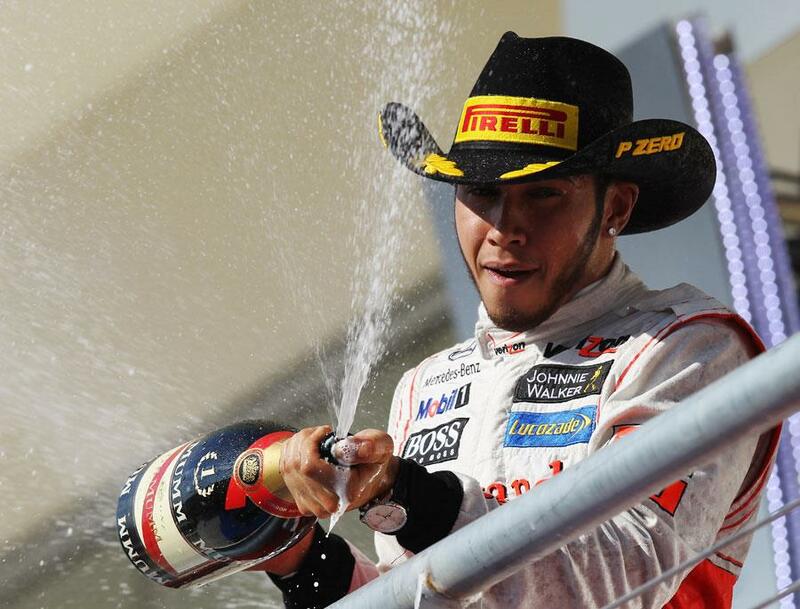 Race winner Lewis Hamilton wearing Austin's signature hat! than any other race on the F1 calendar! Everyone likes to check out a new restaurant. But most people only go back if they like the food. Let's hope that Austin's popularity will continue even as the newness of the venue wears off in a few years. Hey, even if you don't like the race action or think that the race series is short on driver personalities, there's always the F1 pit girls! 1) What happens to this venue when Texas secedes? 2) Rick Perry is pretty much a dope. 3) The SPEED crew mentioned that Schumacher has purchased a 500 acre ranch in Texas because he likes the area. 4) For this non-F1 fan, I actually enjoyed watching some of the race as it had some intrigue with the all the corners in the course, seeming to provide more action than what I've seen at other races. The cars looked slow in those sections, but it felt like more of a race than the usual conga line. I'm hoping that was a case of the course layout itself and not just because the drivers and engineers were still trying to figure out the track. Oh, and my wife, while being very concerned about some near misses in the passing, wanted to know if every woman had to have breast enhancements in order to participate. Having read some stories about Bernie, I just said "yes". 3) He figures it will probably be a great investment. COTA's contract is for 10 years. She must have been thrilled to see Patrick Dempsey in the pre-race show. "Let's just hope that 7-time World Champion Michael Schumacher's Mustang won't fail to start at the drivers' parade next time around, so he won't have to hitch a ride from Kimi Raikkonen as he did this year." Actually they got the Stang running I have a picture of Schumacher in the Mustang at Turn 5... although it did delay the parade and it was funny to see the Mustang Fail miserably.